MKS Instruments, Inc. is a global provider of instruments, subsystems and process control solutions that measure, control, power, monitor, and analyze critical parameters of advanced manufacturing processes to improve process performance and productivity. Since 2000, MKS has created breakthrough solutions for environmental monitoring applications. The company has expanded to provide leading technologies and instruments that support environmental monitoring applications including toxic gas monitoring solutions that safeguard critical infrastructure. In Defense and Security, the company’s expertise is utilized across a broad spectrum of technologies with devices ranging from infrared imaging tools to sophisticated targeting equipment. MKS’s products are derived from their core competencies in pressure measurement and control, materials delivery, gas composition analysis, control and information technology, power and reactive gas generation, vacuum technology, photonics, lasers, optics and motion control. Drawing from a broad portfolio of innovative instruments, components, subsystems and softwares across 15 major markets, MKS applies leading edge science, engineering, and technology to solve your critical mission challenges. Together, Federal Resources and MKS Instruments aim to understand customers’ strategic objectives and partner with them to provide the products and solutions needed to achieve mission success. 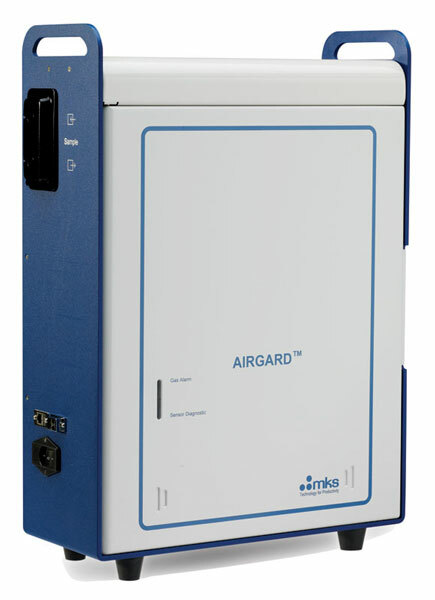 AIRGARD® ambient air analyzer is a self-contained, ultra-sensitive, Fourier Transform Infrared Spectroscopy (FTIR) based gas analyzer that rapidly detects toxic gases, including Chemical Warfare Agents (CWA), Hazardous Production Material (HPM), and Toxic Industrial Chemicals (TIC). Browse all MKS equipment in our online store.